We are a family from Calgary but have been skiing in Fernie for over 30 years. We know the resort and the town inside out and love to share the many experiences it offers with people from around the world. 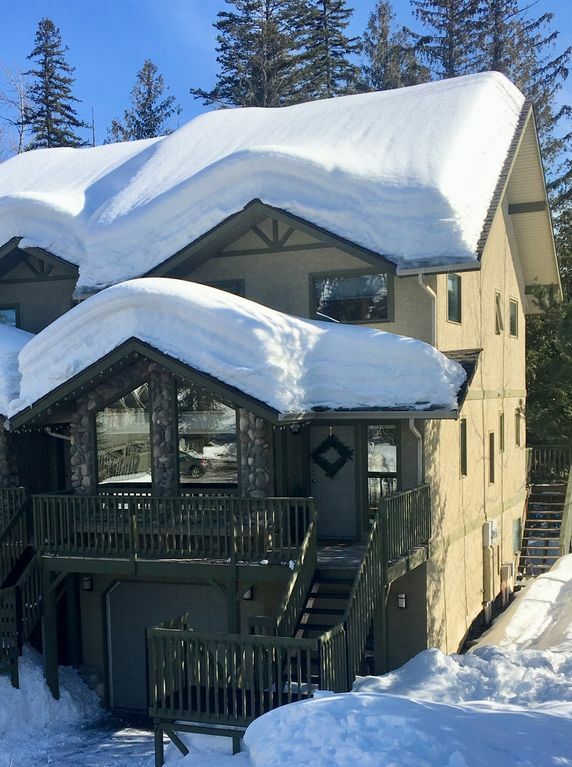 Fernie, and specifically this wonderful condo, really let's you unwind. Often we arrive, and don't get back in the car to go any where for days as everything you need is right there. So great not to have to drive! Location. Location. Location. Many people market their properties with great location or best location. Thunder Ridge, and specifically this unit in Thunder Ridge, truly is the best. Look at the photos and you can see that you literally step off the back deck, and start skiing down to the lifts, AND you can ski back right to the same spot for lunch or the end of the day. Within a 5 minute walk are Fernie Alpine Resort's restaurants, pubs, spas, as well as the village convenience store. 5 minute drive to the town of Fernie for restaurants and shopping. A shuttle goes between Fernie Alpine Resort and the town. Great view of ski runs and top of the mountain. Holo hike (beginner) ski run at foot of back stairs to take you down to lifts. Easy ski back when done skiing so no walking - ever. Great for families with young kids. Ski down 1 minute to Elk Chairlift and ski back to door via Holo-Hike run. Garage available for ski equipment. Waffle maker, Panini maker, blender. All new stainless steel kitchen appliances installed in 2015. Bluetooth speaker, easy to connect to so you can play your music off your phone. Private Hot tub on back deck. We had an amazing week skiing Fernie -- the condo is RIGHT on the hill, access for skiing could not be better. The kitchen is well stocked and beautiful, and we had plenty of room for our 16 month old, us and our babysitter all week. The owners are super nice and helpful. All in all a great experience, and we will be back! Just perfect! The condo couldn’t have been better for a Fernie ski holiday. It is an excellent ski-in & out location, spacious, supplied with all kitchen & other essentials, and is cozy and beautiful. We would absolutely stay here again. Amazing condo. And amazing owners to deal with. Thanks for staying! I am happy that you had a good time and we hope to see you back in Fernie again! Fantastic location. As close to the hill as you can get. Roomy condo with a great open plan for families and visiting. Better than the pictures of the property suggest. Great hot tub location on the back deck with lots of privacy. Scott D.Where do you live? The location is perfect very roomy has a great kitchen nice floor plan, great hot tub overlooking the mountain, ski locker in the garage was such an added bonus, we would definitely stay there again. Thanks to the Novak's for a great trip and being so courteous and professional. The rear balcony is approx. 15 feet away from an access slope. Cannot ask to be closer. The overall condition of the property was good and clean. This property has been build probably 15 or so years ago and it shoes a bit. Some renovations have been done and it seems that the owner are still putting money into the property in ordor to maintain it in relatively good conditions. The master bed room is ok but the two other rooms are quite small. It is a place I would not hesitate to return or recommand. Thank you for your review, we are so lucky to have such an awesome location next to the ski out. We are continuing to update our condo and are excited about a kitchen renovation this summer. We cannot guarantee the ski conditions during the ski season. If the ski hill is open, cancellation is per contract. 100% deposit refunded minus $50 admin fee if cancelled 45 days prior to stay 75% deposit refunded minus $50 admin fee if cancelled 30 days prior to stay No refund less than 30 days prior to stay. In some cases, the owner may allow the guests to change booking to any open dates within the ski season. There is a self-contained lower unit that may or may not be occupied during your stay.